Are you one of those people who routinely has 3500 unread emails in their inbox? Do you often post about this ruefully on Facebook only to have someone reply: just delete them all, if it’s important that person will email back? There might be something really important in there. Once-in-a-lifetime important. If someone emails you with a once-in-a-lifetime opportunity and you don’t respond, they might very well decide you’re not at all interested. It doesn’t have to be this way. Staying on top of your inbox is not that hard! I don’t understand the people who have one folder in their email program (that being their inbox). Every email program allows you to create folders so it’s time to make use of this important feature! Once you have these folders, start filing stuff. It’s not necessary to ever delete an email (unless it’s spam or promotional emails you have no need to ever reference again) – all emails should be filed. I know a lot of people who happily rely on the search function in their email program to find things later, but this doesn’t help the fact that your inbox has 10,000 emails in it. Your inbox should not have 10,000 items in it! If an email can be answered in five lines or less, then answer it right away. If someone has sent you an essay don’t feel you need to answer with an essay yourself. I am sure people sometimes think my email replies are a little brusque but … too bad! If the email is long and I am pressed for time, I skim it and then answer each question with a one liner. This means that pretty much ALL emails can be answered in five lines or less … and thus can be answered immediately. I have my email synced with my iPad and my iPhone. That means I don’t have to fire up my laptop to access my email. I seem to get a lot of spammy/unsolicited type emails overnight so the first thing I do every morning is open my emails on my iPad and quickly delete all the crap. I then scan the emails that aren’t crap and answer anything that can be answered in a few words. That way, when I do get to my desk ready to start the work day, I know what’s waiting for me in my inbox and am ready to quickly despatch the things that I can. Being able to access your emails on the go means that when you are looking to kill time on the bus or while standing in line at the post office, you can kill time in a useful fashion. I went through a period a while back where I signed up for every free resource, every blog I liked and every email newsletter. And I’ve been trying to unsubscribe from most of these things ever since. The thing is, once you’re on a list of any description, it’s really hard to get off of it. Having a separate email for signups means all those emails are going to another inbox – one that you can be very ruthless with when it comes to doing mass deletes. Are you answering the same question over and over again? Do you personally thank everyone that signs up to your blog or email list? Then have a standard reply saved somewhere that you can easily copy, paste, personalise and send. Has a client sent you 10 emails all related to one action or job? Attach all 10 emails to a single email and send it to yourself. This combines 10 emails into one. Then you can delete those 10 emails that are sitting in your inbox. Your inbox should only contain emails that will be answered or actioned today or tomorrow. Set up folders for Monday through Sunday and file the rest of the emails into each day depending on when they will be actioned /answered. Do you need to be emailed every time someone mentions you on Twitter or tags you in a photo on Facebook? Short answer is – no, you don’t. Both those platforms tell you who has mentioned or messaged you whenever you login to them. Which I am guessing is several times a day. Ditch the email notifications and your inbox will breathe a big sigh of relief. 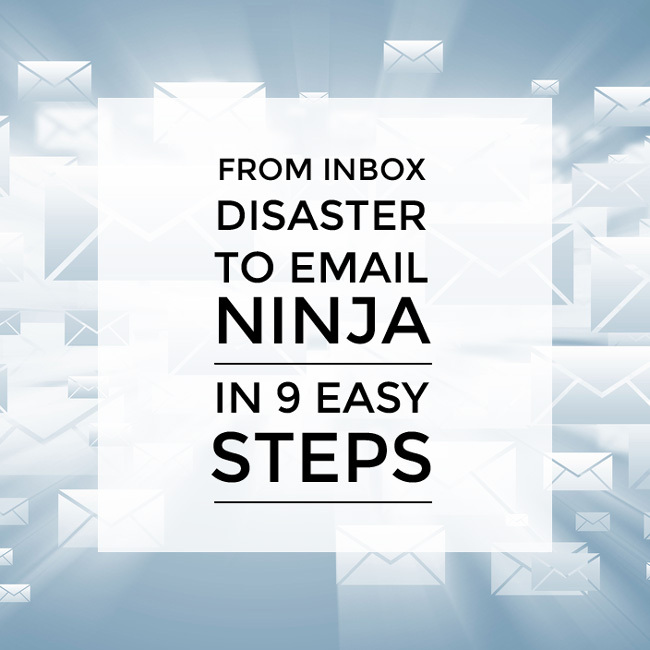 Are you an email ninja or an email disaster? If the former – what’s your favourite strategy for staying on top of things?